Cable holds firmer tone on Tuesday and probes above 1.33 barrier, which capped the action in past two days. 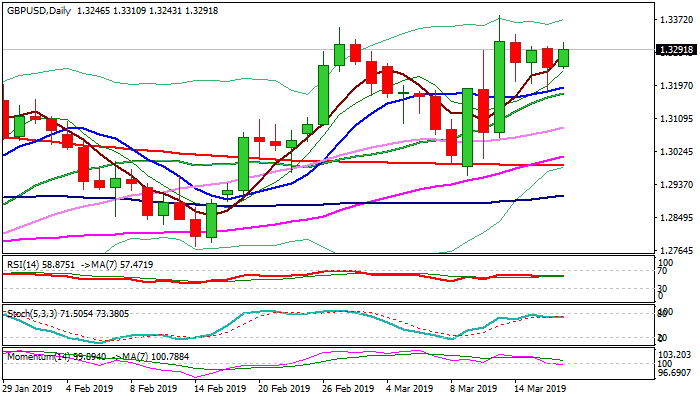 Fresh advance retraced Monday’s weakness (dip to daily low at 1.3184 was contained by rising 10SMA) after PM May’s attempts to force another vote on her plan was struck down for procedural reasons. Brexit drama continues, with scenario of 29 Mar exit without a deal, returning to play that would reduce PM May’s space for maneuver in attempts to ask the EU for a short extension of 29 Mar deadline. Bullish signal for sterling came from solid UK labor data on Tuesday (Avg earnings Jan 3.4% vs 3.2% f/c/New jobs in 3-mths to Mar 222K vs 120K f/c/Unemployment Jan 3.9% vs 4.0% f/c/prev) that could help those advocating BoE rate hike later this year). Break and close above 1.33 handle is needed for bullish signal for extension towards key barriers at 1.3381/86 (new 2019 high, posted on 13 Mar/50% retracement of 1.4376/1.2397 fall). Bullish bias is expected to dominate while the price holds above rising 10SMA (currently at 1.3192).